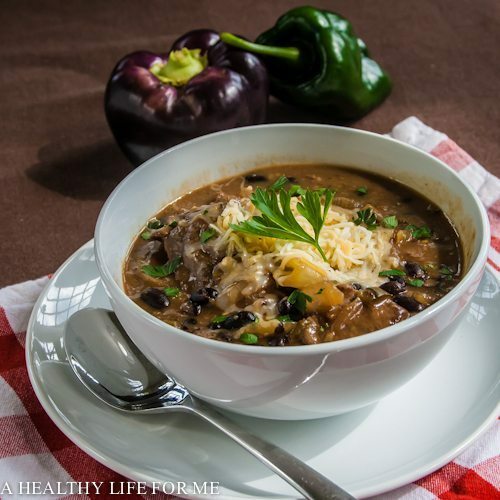 Brazilian Beef Stew is simple to prepare, a hardy recipe with layers of great flavor. Perfect for the whole family that will warm up and satisfy even the picky eaters. I stumbled across this short and simple recipe in Silver Spoon cookbook and the idea of coffee and wine had me interested. I had never put those two ingredients in the same dish. Made me wonder who thought it up? Since I am still dealing with the pepper surplus from my garden I thought I would give it a try. I deviated from the cookbook recipe by adding the beans at the end. I just thought it needed a little bit more substance to make the family happy and the beans were a wonderful addition (plus I added extra protein-bonus). The boys all gave it a thumbs up, so it will be on my winter dinner rotation, plus it was so darn easy to pull together it will be a favorite of mine. 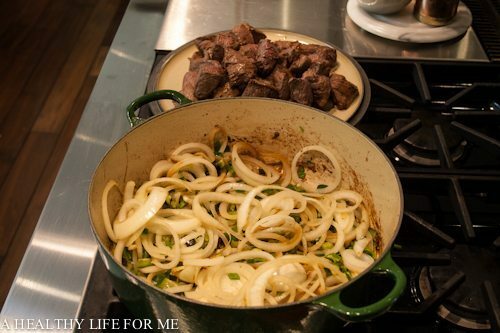 Heat the oil in a large dutch oven or pan, add the meat and cook, stirring frequently, until browned all over. Remove the meat and keep warm. Add onions, garlic and peppers to pan and stir to coat with meat juices and cook over low heat, stirring occasionaly, for about 10 minutes. Sprinkle in the flour and cook, stirring constantly, for 2-3 minutes. Gradually stir in the wine and coffee and bring to a boil, stirring constantly. Return the meat to the pan, season with salt and pepper to taste. 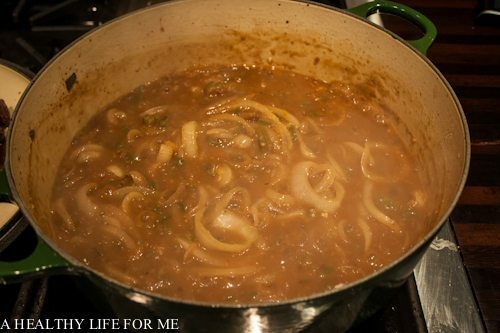 Add Beans, cover and cook for 1 hour or until the meat is tender. If you plan on freezing do not add beans, continue to cook until tender, cool completely, package and freeze. When reheating add beans, and serve. Looks great Amy. White wine and coffee? Interesting combo in a stew! I know right, I had to try it cause it seemed so weird, but it really works. I just want to know how they came up with mixing the two?? This stew looks delicious! Adding wine always enhances the sauce or the soup. Julia, Yes I always seem to throw in a splash of wine in soups and stews, but never coffee and white wine together. An odd combo but really delicious! Such an interesting combination of flavours. I’ve been looking for a new twist on the beef and beans casserole combo, so this will be on the menu next week. After you make it let me know what you think. I always love feedback. Is it possible to substitute broth for the coffee? Yes, but I would use a Beef Broth, Chicken or Vegetable would be too light. I was so enticed by the photo! I made something Brazilian recently and loved it so I know it is going to be superlative. I think the taste of brazilian beef stew will be very different! Thanks for sharing. It is an awesome stew recipe Meredith. The coffee adds a great layer of flavor.